A survey used tests offered through Web searches or in online ads to measure the IQ of browser users. (CNN) -- Are users of other Web browsers smarter than the people who use Microsoft's Internet Explorer? A new survey doesn't quite say so. But it sure as heck suggests it. And users of the more obscure Camino and Opera browsers, as well as those using Explorer with Chrome Frame (a plug-in designed to let users view emerging HTML5 content), had what AptiQuaint called "exceptionally higher" IQ levels. Those numbers, it should be noted, probably aren't very scientific. The field of test-takers was self-selecting -- people who chose, on their own, to take an IQ test instead of a scientifically selected study group. They found the test through Web searches or ads the company placed online. 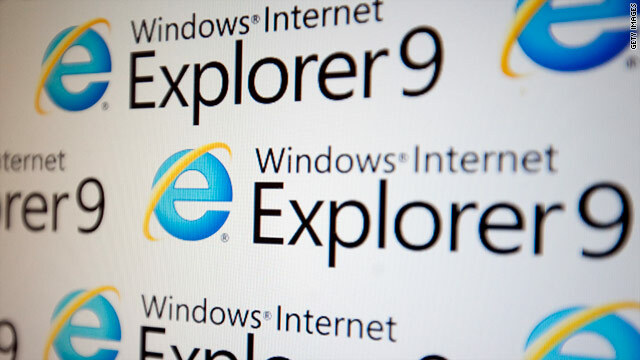 The report suggests that people using Explorer, the built-in, default browser for Windows-based computers, may be more resistant to change. A similar study in 2006 showed users on the then-current IE browser scored above average. Internet Explorer is the world's most popular browser, with about a 43% share, according to StatCounter. Firefox has just under 30%, and Google's Chrome has 19%, according to a report from May. IQ scores have a "population mean" of 100. If this all smacks of a little good, old-fashioned Microsoft hate, the language the company uses in its report doesn't do much to downplay that. "It is common knowledge that Internet Explorer Versions 6.0 to 8.0 are highly incompatible with modern web standards. In order to make websites work properly on these browsers, web developers have to spend a lot of unnecessary effort ...," said the report from AptiQuant, which offers online tools for employers to measure employee, and potential employee, aptitude. "Now that we have a statistical pattern on the continuous usage of incompatible browsers, better steps can be taken to eradicate this nuisance." What do you think? Cheap shot or telling results? Let us know in the comments.